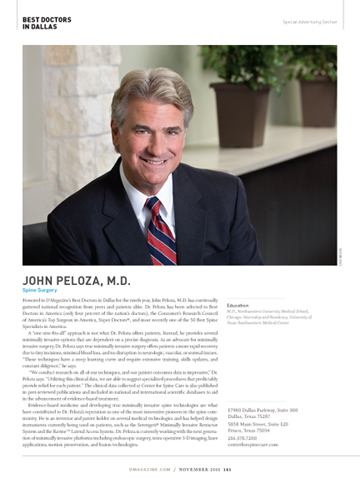 Congratulations to CSC’s Medical Director, John Peloza, M.D. 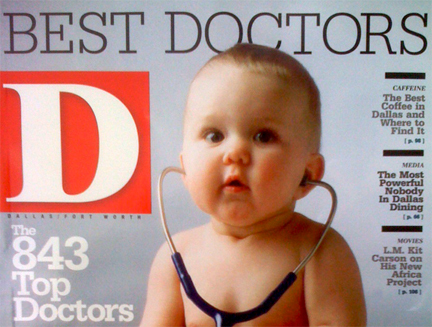 for being selected once again to the prestigious D Magazine’s “Best Doctors in Dallas” list for 2011! Dr. Peloza has been continuously voted to the Best Doctors list since 2003. Best Doctors in Dallas is a peer-reviewed voting process. The 2011 list includes the top 699 physicians in 43 specialties. The list was just announced at a reception honoring the Best Doctors and is in the current issue of D Magazine. Doctors can not pay to be on the list. Here’s how it works according to D Magazine: Almost 8,000 letters were mailed to local doctors inviting them to vote in 43 categories with this question in mind: “Which Dallas doctors would you trust with the care of a loved one?” Then D Magazine vetted each voter’s Texas medical license number to ensure it was valid. The results were then sent to an outside marketing firm to tally votes. They presented the tallied list to a panel of esteemed physicians who reviewed the results with the D staff and chose the finalists based on the number of votes received in each category. This esteemed physician panel is granted anonymity to encourage open discussion regarding doctors on the list. Join us in congratulating Dr. Peloza for all of the great, compassionate care he continues to provide his patients as well as his determination and skill to continue pioneering modern, minimally invasive spine treatments! He is the best spine doctor in Texas as far as I’m concerned! And, I am living proof! Congrats, Dr. Peloza! Thank you so much Cathy! We are very proud of Dr. Peloza! I am proud as well to know such a neat Doctor!!!! !